The Oceania & Australian Open Laser Championships run from Royal Queensland Yacht Squadron at Manly concluded on 4th January. Eleven of the scheduled 12 races were completed after one full day of racing was lost due to light and variable winds. In the 75 boat Radial fleet Zac Littlewood WA won six of the eleven races for a 6 point win from New Zealander Josh Armit. 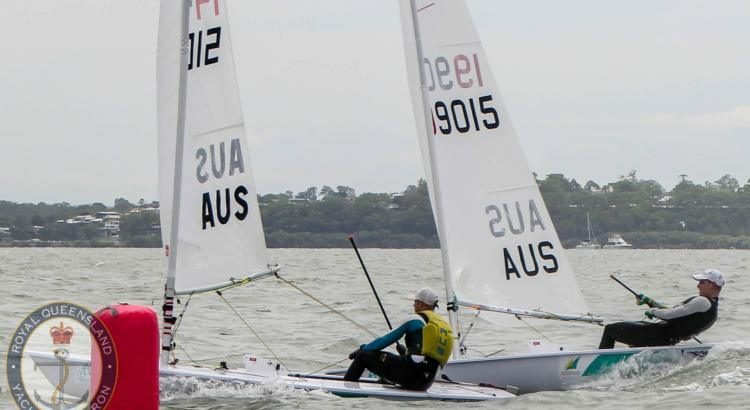 Josh is the current World under 17 Laser Champion and was 4th in the Laser Radial Youth Worlds in Medemblik, Netherlands. Yoshihiro Suzuki from Japan was third. In the Women’s event Manami Doi (Japan) currently World rank 6th won from Zoe Thompson WA and Marlena Berzins NSW. Manami was 8th overall in the Radial fleet. Michael Compton WA was a comfortable winner in the 4.7’s with five race wins. Wonn Kye Lee from Singapore was the runner up from Boston Cortis NSW. With a record 62 4.7’s entered in the event competition was fierce. As expected Matt Wearne WA and Tom Burton NSW were in close company both around the race track and on the scoreboard in the Standards. Each won four races however Matt finished up just three points ahead of Tom after the eleven races. Mitchell Kennedy QLD had two wins and consistent places to finish a clear third. There is a more detailed write-up of the series from QLA HERE. You can see the results for the 4.7’s and Standards HERE and the Radials HERE . The event web site is HERE.